Looking for a holiday off the beaten path? Go to Reunion Island! Amazing indeed. But it’s a real shame that no one knows about this island! Actually, maybe that’s the beauty of it. Maybe it’s meant to be kept a secret. Or maybe it’s yet to be discovered, so let’s hope this post helps us put this great French island on the map for a few more people. Because it’s a trip worth taking! There’s no direct flight between London and Saint Denis (the only airport in Reunion Island). So we flew from London to Paris, and then from Paris to Saint Denis with Air Austral. The flight is approximately 11 hours, so if you’re travelling with children, be prepared! In fact, the whole trip door-to-door was about 22 hours. Tiring. 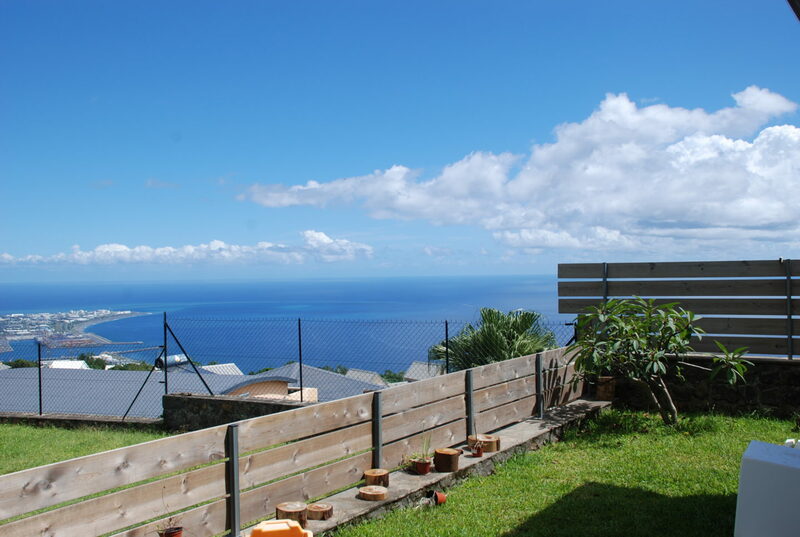 I can’t help much here, I’m afraid, as we stayed with our friends in the western part of the island, in La Possession. We were told there isn’t a huge amount of choice when it comes to hotels, so if you’re planning to go, make sure you book early. Renting a house or apartment through Airbnb is definitely another good option. You definitely need a car. There isn’t much in terms of public transport, so hiring a car from the airport when you get there is a must. It’s not the biggest airport either, so it may be better to book one before you get there. The largest motorway around the island is mainly on the coast, so you’ll enjoy some amazing views while you drive around. A brand new road is also being built on the sea (yes, ON the sea). It’ll take a few years to be completed, but it’ll surely be stunning when it’s all done. This is our list of places to visit, based on where we went and what we did. It’s by no means an exhaustive list, but we can most definitely recommend all of these places. So, in the chronological order we discovered these beautiful gems in, here are our top recommendations. 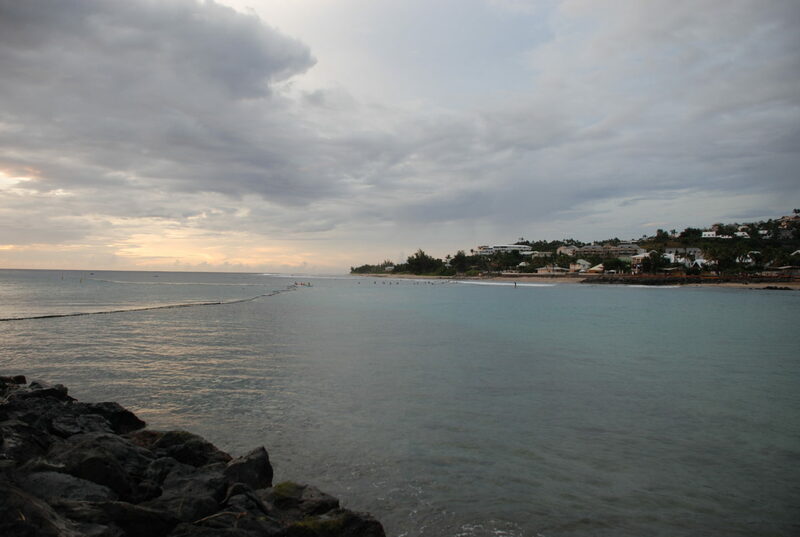 This is one of the beaches in the western side of the island – the ocean here forms a natural lagoon. So the water is shallow, and the waves stop further out at the coral reef. 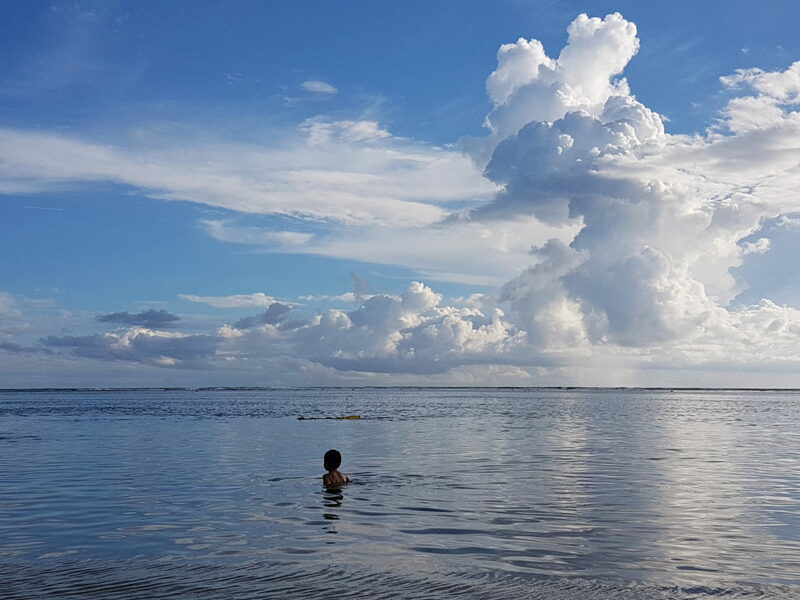 Most importantly, a beach with a lagoon is one without sharks, so a safe one to swim in. 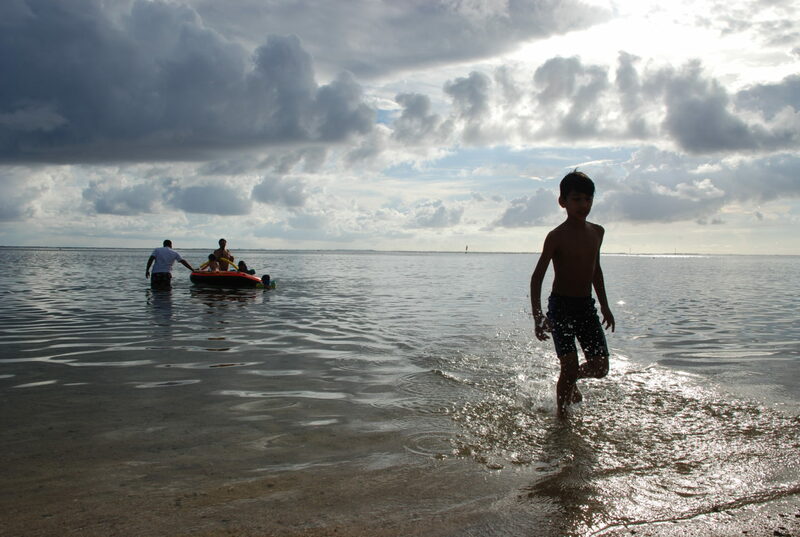 It’s a really nice beach with white sand, and a great place for snorkeling and watching the sunset. Although, to be fair, they all are! Worth a trip to the South of the island if you get the chance, this is another beautiful beach. There is no sand here, and it’s quite a small one – the parking lot is a lot bigger than the beach area in fact! 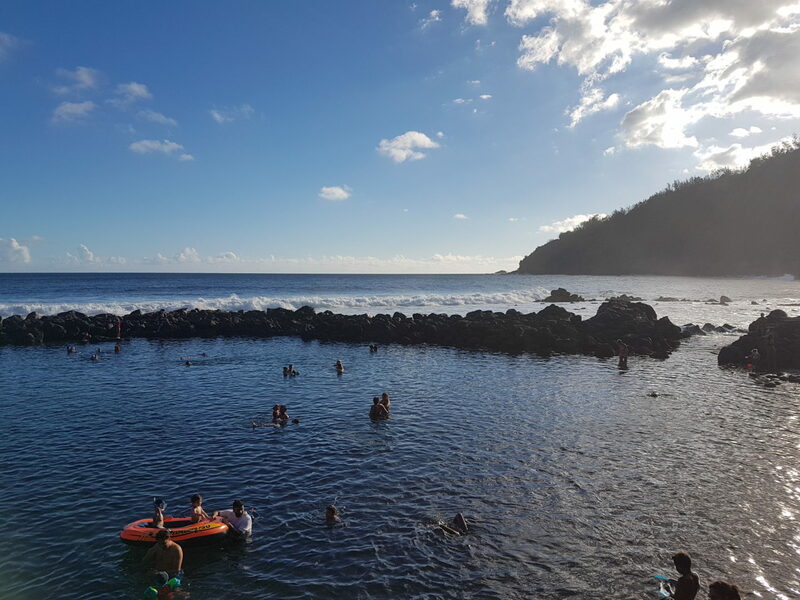 A perfect place for snorkeling, access to the ocean is via big rock steps that take you right into a rock pool. I’m not sure whether this is a natural rock pool or whether some ‘help’ was required to make it what it is today, but it’s a beautiful spot to visit and snorkel in nonetheless. The rock pool in Manapany. This soon became our favourite place – we went here several times. It’s a very popular destination, and it gets really busy, so parking can be a bit of an issue sometimes. There are plenty of restaurants and bars in the area though, so you’re really spoilt for choice when you want to get something to eat. We brought our own (well, our friends’) umbrellas to the beach and stayed there as long and as late as we could most days. Swimming-wise there are a few things to know about this beach though. It’s a surfer’s spot, but swimming, surfing and other water activities are only allowed on certain days. The waves get quite big here, and when they get too big, the red flag will come out. And no one will be allowed in the water. When that happens, not all is lost though, as this is another one of those beaches with a with a natural rock pool. The water is shallow in there, and it’s a perfect spot for children. While the swimming and surfing flag will often be green, the shark flag is never green here. You get a red shark flag when a shark has been sighted, and an orange one otherwise. The area is protected by shark nets, but because there definitely are sharks in the area, there’s always a danger of sharks being present! So no green flag there. And although we were quite pleased to not have seen any sharks, we would have loved to see the whales, but they only turn up in August (and we went in April). C’est dommage! Reunion Island has a lot of rivers. And mountains and hills. 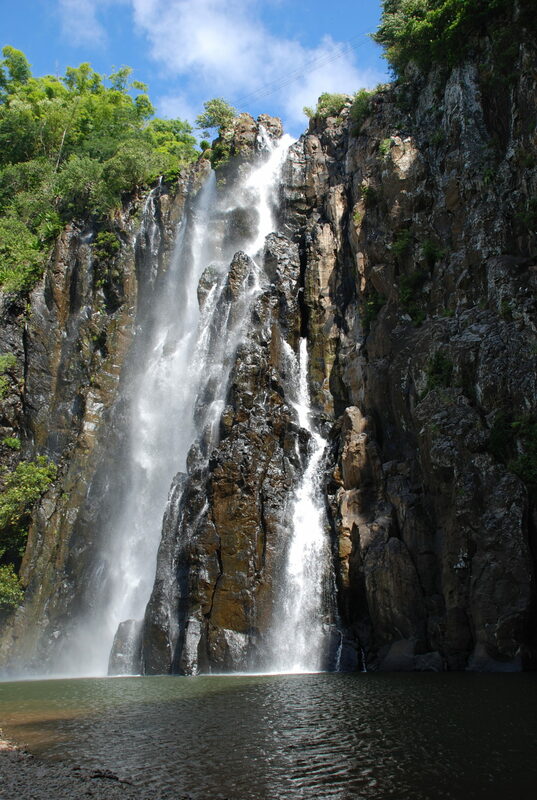 So it has a lot of waterfalls too. We went to see only one, in the North, not far from the capital, Saint Denis. It’s not a huge area, but it’s a great picnic spot. The boys went into the water, but they weren’t in love with it – it was a lot colder and murkier than the ocean apparently. But they went off exploring the area and jumped into a pond or two, so they were happy with the day out (despite moaning that we didn’t go to the beach). One day, when our friends were at work, we found ourselves stuck at home. It was raining quite heavily and come 3pm, we still hadn’t dared venturing out. Where were we going to go if we couldn’t go to the beach? It took a phone call from our friends for us to realise that the weather doesn’t quite behave as it does in London. It never occurred to us that it may not be raining at the beach – after all, we were quite high up on a hill, and it turns out that the coast was indeed nice and sunny all day. As it often is, apparently. But, as it was too late to go to beach, we decided to head off (eventually) to go to the aquarium. It wasn’t our boys’ first aquarium experience, as in the last few years, we’ve seen a few (Sea Life in London and the Malta National Aquarium come to mind, for example). But The Little Guy was wowed, and it was a real hit with him. We then took a nice walk around the sea front in Saint Gilles, where we got to see a lot of fishermen, a lot of surfers, and a cloudy but beautiful sunset. The one thing we knew we wanted to do before we even left home was to go and see the sea turtles. 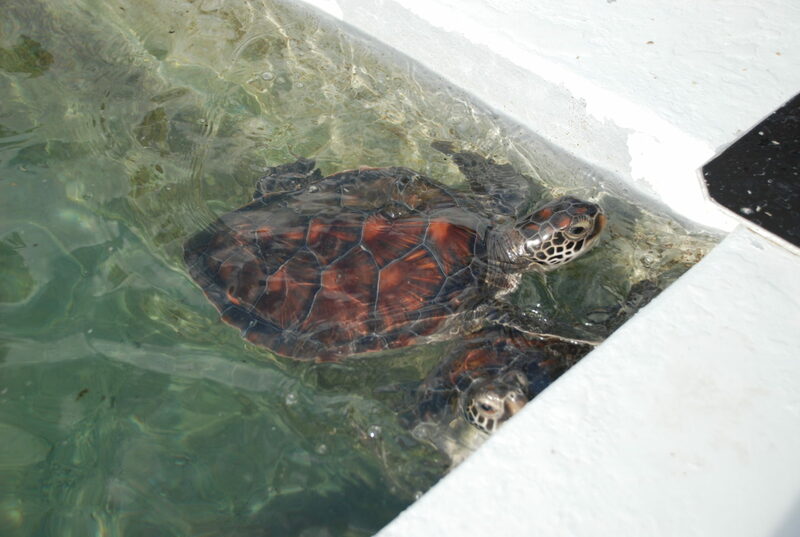 As you don’t get to see them on the beach, we went to see them at the Kelonia observatory, where sea turtles that are rescued are nursed back to full health before being released (and tracked) back into the ocean. We had a nice lunch overlooking the ocean in Saint Leu, watching a brave surfer challenging the waves on a very hot day! I wont’ bore you with the whole story of how the island originated, but Reunion Island is a volcanic island. 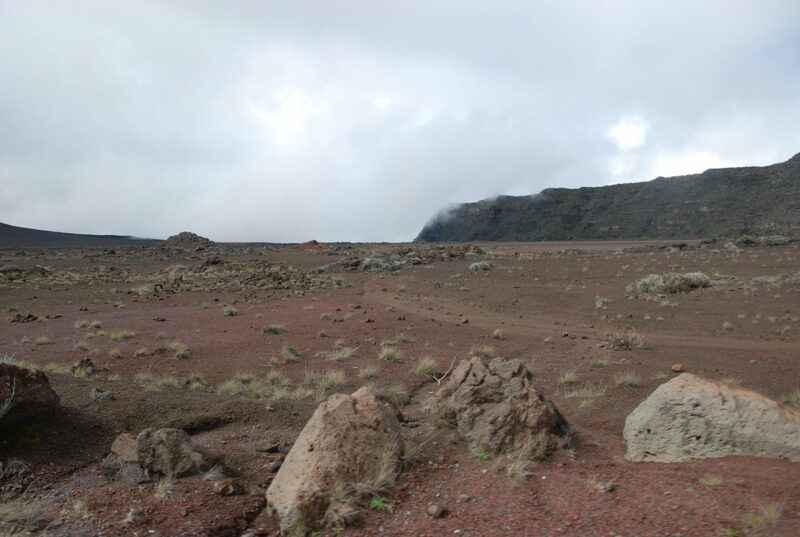 And while one of the two volcanos has been dormant for a very long time, the one on eastern side of the island isn’t. It’s very much an active volcano (one of the most active in the world, apparently). 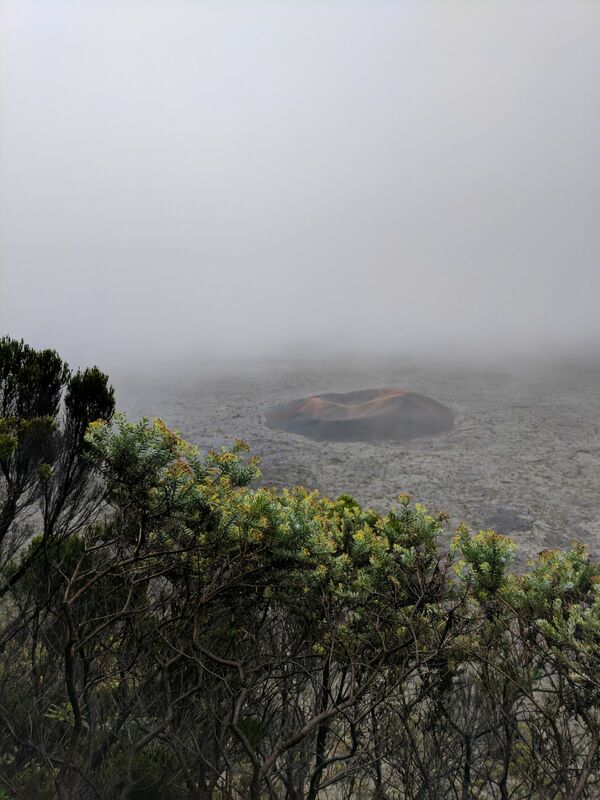 And we had the privilege of driving through the Réunion National Park (a World Heritage site) all the way to the top (Bellecombe Pass), where you can park your car and get ready for a long hike to go and see the main crater. It truly is a spectacular site – the drive up to there is stunning. You drive through a forest road which then turns into a very bumpy road surrounded by a very dry and surreal area. Before going, we had seen photos of online comparing this area with photos taken on Mars. And the landscape was quite similar! Once we got to the top The Husband and our two older boys got to walk to the smaller of the two craters. It was wet, and a bit of a hike, so The Little Guy (aged 2) and I stayed in the car. But the whole trip there was just amazing. You don’t get to walk up close to a volcano very often, do you? Last but not least, this is a nice little market where you find very touristic items and souvenirs (from t-shirts to beach bags) as well as local vegetables and fruit. Because Reunion Island is a department of France, people speak French! And you can find a lot of French supermarkets and shops. And you often have a feeling of not being very far from home. Yet, you’re somewhere in the middle of the Indian Ocean, and if the palm trees everywhere aren’t enough of a reminder of that, this market definitely is. The fruit and vegetables we’re used to look different, and there’s a huge amount of fruit on display that I wouldn’t be able to recognise or name! It’s just fascinating, and we were really thankful to have our friends telling us what everything was! We loved this holiday – it’s probably one of the best places we’ve ever been to. There’ll be times when you feel you’re in an exotic island. Others when you’ll think you’re just across the pond. But the landscape is just amazing. You have the beach, the green (oh, the palm trees! ), the mountains and hills, the rivers and waterfalls… and the volcano to top it all off. It’s hot and humid by the beach and cold and dry (or drier) the higher you go. We didn’t quite understand why no one seems to know about this island – everyone knows were Madagascar and Mauritius are. Yet this little gem remains quite hidden. Maybe, as The Husband said, the French people just want to keep it to themselves. And I don’t blame them. 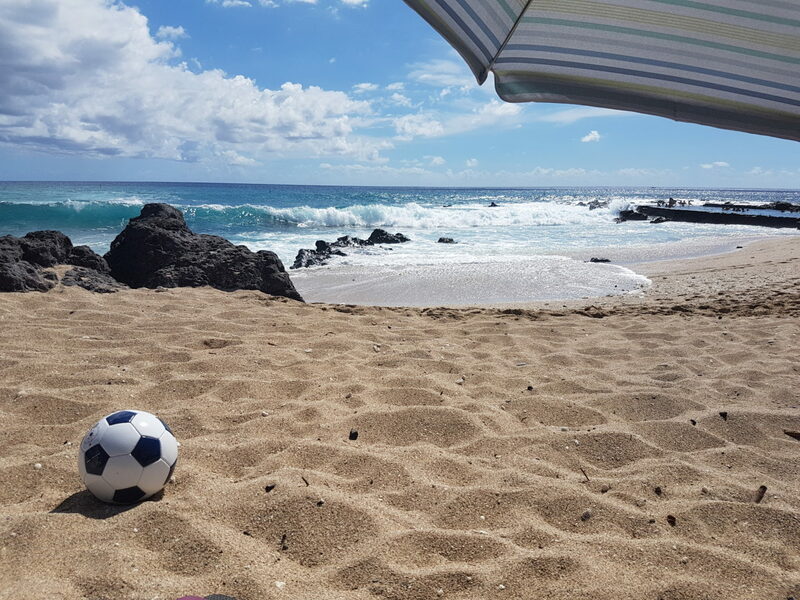 But in the meantime, if you are looking to go somewhere special that’s not very busy and touristy, Reunion Island is a very good pick! 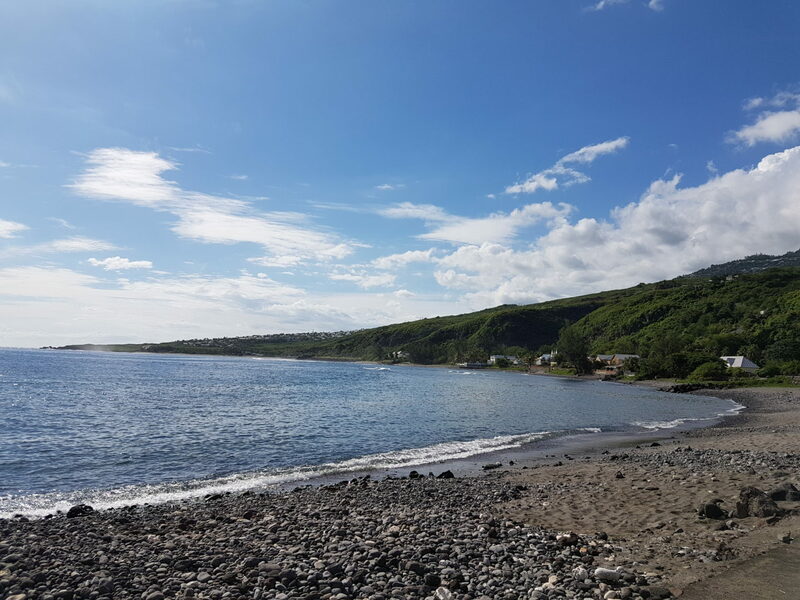 Did you do where Reunion Island was before reading this post? Would you like to go?